Written by David Blake. Published on November 3rd 2014. IT'S BEEN a good Monday morning for Manchester. "Today's historic announcement marks a new era for commuters in Greater Manchester, one in which they can look forward to the sort of seamless travel they may have experienced in London moving from the tube to bus." Not only has the government confirmed a historic devolution deal for the city including a directly-elected Greater Manchester major by 2017, Chancellor George Osborne has just confirmed a new transport deal for Manchester. The new deal includes a £350 million Metrolink extension through Trafford Park (see here) and the wider roll-out of an Oyster-style travelcard system (titled 'Get Me There') linking Greater Manchester's trams, buses and trains. The Chancellor unveiled the transport deal on Monday 3 November while visiting Metrolink's newly opened Manchester Airport line (see here). Osborne said: "I am delighted to be able to mark the opening of the new Metrolink line to Manchester airport over twelve months ahead of schedule. The network now covers over 92km and is a vital economic asset for Manchester. "It is also great news that, thanks to the devolution deal I have agreed with Manchester today, there will be a further £350 million extension to Trafford which will provide significant additional benefits to the city. The Metrolink will come under the powers of the new Mayor, supporting an Oyster-style travelcard system that will make traveling on the network and all of Greater Manchester's public transport simpler and easier. "These are exactly the sort of transport improvements that will not only allow Manchester to prosper and thrive but also help turn our vision of a Northern Powerhouse economy into reality." The deal also unlocks access to longer-term local transport budgets and provides access to as much as £900 million over 30 years, dependent on economic performance. The council hope the deal could also open the door for further discussion around the local management of Greater Manchester's local railway stations. Subject to consultation, the new transport deal could also see a 'London style' system of bus franchising for Greater Manchester. Councillor Andrew Fender, Chair of the Transport for Greater Manchester Committee, said: "Today's historic announcement marks nothing less than a new era for commuters in Greater Manchester, one in which they can look forward to the sort of seamless travel they may have experienced in London moving from the tube to bus. "This deal will, subject to consultation, allow us to move to a model of bus franchising, similar to the system used in London, providing us with the ability to set bus routes, frequencies and fares for the benefit of the people of Greater Manchester. "The deal also unlocks access to very substantial amounts of transport funding - providing more certainty and the ability to plan ahead. Not only that, it means that we can move ahead with the construction of the Metrolink line through Trafford Park to the Trafford Centre, a scheme which will benefit thousands of people and many businesses in the area. Following the Chancellor's announcement Transport for Greater Manchester will be developing a detailed implementation plan with the government on behalf of the Combined Authority along with a delivery timeline and full public consultation on bus franchising will take place in due course. 92 comments so far, continue the conversation, write a comment. Shy Bald BuddhistNovember 3rd 2014. Brilliant news. The more lines on the Metrolink the better as far as I'm concerned. Wonder where the next line will be? I've always thought Oxford Rd would be good, but it'd be a nightmare for traffic while it was being built I suppose. What about Swinton, Walkden, Little Hulton, Farnworth, Bolton? or Longsight, Rusholme, Reddish, Heaton Chapel, Stockport. Also great news regarding the buses We have far too many doing the same routes clogging up roads and none doing the less lucrative routes. I take your word for it. I'm not over familiar with the area. I just know when I'm in town I see hundreds of buses mainly for Stockport and Bolton. And the met normally has more stops than trains so its better for more people. An underground line for the busiest route would be best - St Peters Sq, Oxford Road down to Universities etc. And an underground circle line round the edge of the City Centre linking up Piccadilly, First Street, Spinningfields, NOMA, Ancoats.. I'd love that to happen but i can't see us getting the money for any part of the system to run underground. It would reduce the number of buses running up and down here so much. There's various political and geographical reasons an underground line isn't viable in Manchester. There's already a plethora of tunnels bored in the 1940s by Polish refugees, hired because they didn't speak English so they were unable to tell people about the work they were doing. Why can't Manchester have an underground Trish? If we had one on the route suggested it would be packed day and night. "There's already a plethora of tunnels bored in the 1940s by Polish refugees, hired because they didn't speak English so they were unable to tell people about the work they were doing." That old wives tale! The number of people who repeat that daftness without thinking about whether it makes any sense. One question: how would not speaking English stop them from telling people that they had built a large underground complex beneath Manchester? And do you really suppose they wouldn't have eventually learned English? Daft. The fact that those tunnels were kept secret for over 30 years speaks volumes. Mr Norman MoleNovember 3rd 2014. The tunnels you refer to are the Guardian Exchange Tunnels and they could not be used because they're at the wrong depth, are the wrong size and unless you want a train to Ardwick or to Chapel Street from close to Piccadilly Gardens wouldn't be very useful. 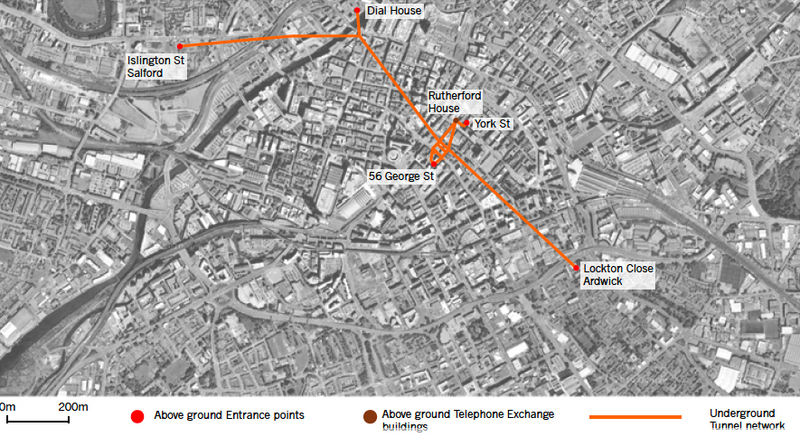 There's a network of cold war bunker tunnels underneath Manchester. They're now used by BT. There was a fire in one of them in 2003 which is when they came back into public consciousness. Extentions from East Didsbury to Stockport and one from Radcliffe to Bolton.These are the big town priorities. That is half a million more people on the system. Oxford Road as you say for the University the MRI and the Curry mile is a must. YAYY!!! Let's build a massive out of town shopping centre and then seventeen years later build a massive and expensive public transport link to it! FFS!!! And lets build Media City and bring hundreds of jobs to Manchester. And lets develop Salford Quays and all its attractions and bring thousands of tourist to the area. And lets build Event City one of the biggest exhibition centres in the country, next to a Sea Life Centre and Legoland in the same area as two of the biggest sporting grounds in the country.... but lets not build Metrolink to serve it. And have you ever considered the "out of towners" who live here might want to travel in to town? Trafford Centre wasn't approved by the council - it was decided by the government. Two facts about the Trafford Centre: It was built back to front. And had it failed as a shopping centre, it was going to be turned into a prison. @Shy Bald Buddhist 'And have you ever considered the "out of towners" who live here might want to travel in to town?' What public transport is available to people in that area now? Just buses I'd imagine. Looking at the website for this line is says 1,300 business are based in Trafford Park alone, over 33,000 employees and the likes of Event City and the Trafford centre get over 30 million visitors a year. I don't see why there shouldn't be a Trafford Line. Add in the Quays, Media City, Old Trafford. It'll be a good addition to the the network in my opinion. @Shy Bald Buddhist Hang on. You said 'live here' as in you live there. Now you're saying you 'imagine' just buses are available? So you don't live there, nor do you know about their public transport. Good grief!!! Anon, What does it matter? I know it's an incredibly busy part of the region with a lot of the most visited attractions and places of work all located in a small area. I know there's no tube, no metro, no water taxis, no gondolas no rickshaws, no cable cars, so I'm guessing there's just buses as I've seen a big bus stop at the Trafford Centre?! Good grief. Trish I think you have an unusual understanding of the meaning of the word 'fact'. Cloud cuckoo land comes to mind. Trish Karney is an obvious troll. Tory governments seem "far more enthusiastic" about funding transport infrastructure projects up here than Labour governments ever are. Except that it isn't the Oyster card system. Instead of adopting an existing system that would have allowed people to use the card in both cities, and saved a lot of implementation; TfGM decided to create its own version; just to be "different". A waste of money and an ego trip. Why would I want a card the you can use in London? I'm in Manchester. I'm all for our own system. I just wish it didn't have a stupid name. Get me there? WTF! The card system was named by Polish refugees in WW2 who couldn't speak English. By the time anyone found out, it was too late. I heard it was going to ber called the 'Busy Bee'! I will be interested to see how the payment system is delivered; if by card, this shows whoever is making the decisions os not keeping up with payment systems, particularly NFC (Near Field Communication). This can be delivered at a fraction of the cost of delivering an oyster legacy system. If these are not being examined right now, whoever is in charge of the local transport system should get on it. Ive been looking at this lot for three years now for the payment mechanisms for the new Confidential sites. There is a revolution on the way. Seems a bit pointless as the majority of the link just serves an area populated by only a few people full of sheds and car parks to serve another area full of global brands and car parks. Only damaging the economic life of Manchester city centre as far as it is accessible by a few people on foot who were n't able to get there previously. Typical top down flagrant misuse of the public's money by a Tory government. It would have made more sense to have a city centre south line intersecting the Didsbury line by going mainly due south via Moss Side and Fallowfield. "Seems a bit pointless as the majority of the link just serves an area populated by only a few people full of sheds and car parks to serve another area full of global brands and car parks" Or in reality as it states on the website for this line, there's 1,300 business in Trafford Park alone, over 33,000 employees. More and more people are moving to and visiting the Quays/Media City. How on earth will this extension be pointless? Have you ever seen the roads when there is something on at Event City? It wont be pointless trust me. The largest residential development in the whole of the north west is about to be built at the Quays, 1036 apartments, with other schemes about to kick off too. I imagine they may want to go to places other than the city centre at some point, and if they want to head towards the Trafford Centre they wont have to drive there. Get the line built and then look at Bolton, Wigan and Stockport to see if it's viable to have routes to those places. There is a train every five minutes to Stockport! The 192 bus runs constantly. AND it's right on the M60. Nowhere else in Greater Manchester has such a sense of entitlement than Stockport. Trish, I must admit I'd prefer a Stockport met line to the 5000 192's clogging up the road that we currently have. Yeah, it's not like there's a bustling town centre, or thousands of people living in Didsbury. The original line continues to Stockport from East Didsbury. Bet you went to public school yourself or some selective Comprehensive,now you want to pretend your down with the working class.Much like the tax dodging hypocrite Tony Benn,who carefully avoided inheritance tax while preaching socialism all lifetime.Or Labour members like Abbott who sends her kid to private school.This from the party who likes to make snide comments about Osbourne background,which was nothing he could do anything about like Tony Benn with his Dad member House of Lords. I remember being asked by two tourists girls around Pamona how they could get to the Trafford Centre. I'm felt embarrassed telling them that they had to get the bus or a taxi. They understandably looked bemused. Speaks volumes. Why embarrassed? Why were they bemused? There are loads of places accessable only by bus in most cities the world over. Because it was clearly a thing that a tourist would like to visit and they were wandering around scrap yards in Pamona quite rightly assuming that a city in Britain the size of Manchester would have something other than a bus to it? Name me a similar place in another supposed 'world city' that is only accessible by bus? I know what you mean. People will tell you we aren't a world city and don't compare us with (name random city here) The metrolink is expanding and it's only a matter of time before the airport, football grounds, attractions and city/town centres are all joined up. What embarrasses me is the time it all stops running. I can walk out of a club in Munich or Berlin at 4am and walk straight on to the U Bahn and get home without any problems whatsoever. Yet Manchester, with one of the biggest student populations in Europe has a system that stops running at 12.30/1am. What goods that? Interesting to see that the proposed United stop no longer features, you can see the land held back for where it was going to run behind the Premier Inn. Assume the Glaziers weren't prepared to dip into their pockets to fund it. Running the metrolink later will be bloody miles off, I'm just happy that it's being built. Sad that tourists want to go to the Trafford Centre! Trafford Centre gets quite a few tourists, they really like it for the most part. Why, cos you don't like shopping? Wouldn't be my choice to do that, but suspect a lot of tourist enjoy going to Oxford Street. Maybe start a tour of smack dens in Salford? Perhaps that'll bring them flocking it. Other than John Lewis. What's not in the city centre? Forever 21, Banana Republic, Victoria's Secret, Hamley's, Legoland, Sea Life Centre, free and easy parking, late opening hours, not to mention the fact that it's clean and is safe, especially good if you have kids. "Name a similar place in another so called world city that is only accessible by bus" Stanley Markets in Hong Kong, Flemington markets in Sydney, just to name two. Not been to either place, so fair enough I can't comment. But can't recall anybody that I know who has visited or lived there saying they are must things to do, and a quick check of the tourism websites mention neither. I'm not suggesting a metro to Lonsight markets but fair enough, scrap it - a tram link to what was boasted as being the largest shopping mall in Europe when it was built? How preposterous, get a bus. Out of interest, how many times have you got a bus or a taxi to the Trafford Centre? Stanley Market in Hong Kong is very much a tourist attraction. Having lived there for 3 years i can tell you it is, and I am surprised ypu havenever head of them. You asked if there is any world city with retail tourist attractions that are accessible only by bus. Stanley markets are nothing like Logsight markets either. There are many, many eaxaples of non retail tourist attractions accessible only by bus in worl cities. Most of the attractions in Kuala Lumpur for example. I am all for the tram to the TC but it has managed quite well for the past years without one. I don't think it's make or break for the retailers there. I'll ask my boss tomorrow, he lived there a few years back. But the fact that the 3 cities that you have referred to all have large underground systems, doesn't that kind of defeat your own argument? Tram to Stretford, free 5 min bus link to TC, as is advertised on Metrolink publicity materials. If Meadowhall can have a tram AND train station, why can't Dumplington Precinct? 5 minutes? Can I have a ticket to your universe please? F**k me. Only Mancs could complain about something like this. I'm pro bloody manc! Pointing out that only moaning manc types, of which there is a lot, could complain about so something so positive as this. It's the worst trait of this great city. Even Matt Busby was warned about it, thankfully most of them were City fans. Has oil been discovered under Piccadilly Gardens? Why the sudden interest in Manchester from the Tories. I know that Osborne represents the Home Counties wannabes of Tatton but come on,why are we getting all this investment? The Northern Hub,a new tramline to the Trafford centre,new roads,City airport. What next a new palace built in Gorton for the Queen!I know London is about to sink under the weight of fatcat salaries and we need a new capital. It's because they want Manchester to be successful, unlike Labour who's interest is served by it being dependent on them for handouts. Osborne maybe a Toff but he and Cameron have done more for this city in four years around transport that working class Blair and Harman did in thirteen or are you forgetting that the Big Bang was cancelled followed by an announcement the day after of crossrail in London. Credit where credit is due me thinks. Exactly what has he done? Give me one example. Managed to turn round the country's economy from the mess left by the last Labour government for a start. What mess? The banking crisis which the Tories would have made worse by regulating even less? @anon above...are you serious? you really don't know that Labour spent all the money and left the country in a mess? They actually left a note in the Treasury saying 'there's no money left' after they lost the last election. If I ran my business the way Labour ran the country's finances it would have gone bankrupt. And I see no evidence that they have changed. Read 'The End of Britain' in the Economist to see what successive governments of both parties have done to this country... In particular the last Labour government. Dare I say "incompetence on stilts" again in case I get deleted? There was no money left because it was used to bail out the banks. No it's because we had to bail out the banks. ^ Fantacist. Trillions pumped into the financial system to prevent bankrupt banks dragging down the rest of the economy. Of course that came from the magic money tree so doesn't count. Lets get a decent name for our 'oyster card'. Atom is my favourite. Any ideas? and please no football references please it makes us sound so damn provincial. The Greater Manchester Travel Card. Busy Bee. Symbol of our insdustrial city and all that. As it's Mancon, how about The San Carlo card, the Living Ventures card or the This & That card? I don't think the Trafford Centre will attract many new customers by being on a tram line. The appalling place is designed to attract people who like to wallow up to the destination in vulgar, highly polished cars, often of the 4x4 variety, thinking they are being a bit sophisticated and posh. Most of them would probably prefer to moan about their self-inflicted traffic jams than use public transport. I did not want to start a debate on the economy. I just said that the current government has done more on Transport for Greater Manchester than Labour ever has. We actually have a Metrolink network now not just one and a half lines. Does anyone remember that great friend of the North Blair saying he would build a line to the Commonwealth games. That came off didn't it! Unfortunately by then the games had finished. Infrastructure takes years to come to fruition. You are misguided if you think the current activity has much - or anything - to do with the current government. Don't remember the millennium dome being 10 years late but London was you socialists pet. Infrastructure does take time to reach fruition,particularly if it is cancelled in favour of CROSSRAIL by a Labour government trying to hold on to Southern seats in 2010.Osborne and Cameron have at least tried to end the treatment of the people of the North as second class citizens in their own country. Remember the betrayal of Daresbury by Labour folks. Labour is totally out of touch with the white working class. They are a Londoncentric party and Johann Lamond hit the nail on the head when she said they treat everywhere outside the capital with contempt.